My parents had a strict no-sugar policy when I was a kid, so we ate some unusual desserts. One of my favorites was "golf balls," a conglomeration of nuts, dried fruit. and fresh lemon that a family friend came over and helped us make each Christmas in a hand-cranked sausage grinder. 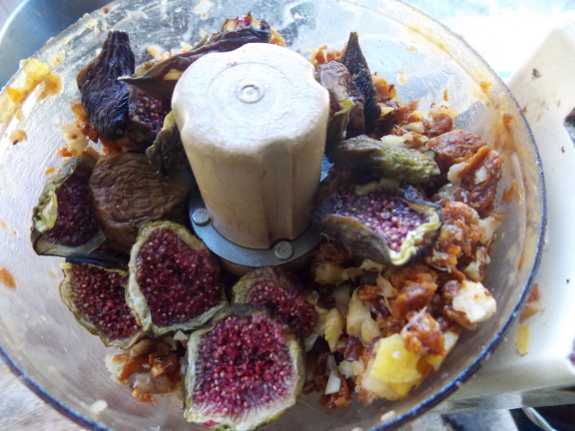 I decided to try blending my own version out of our home-dried fruit (and a few purchased additions), and liked the result enough to share with you. On the whole, I'm happy with the experiment, although I might try again with coconut taking the place of some of the nuts. (I didn't leave out the coconut on purpose --- the one Mark bought for me was moldy.) 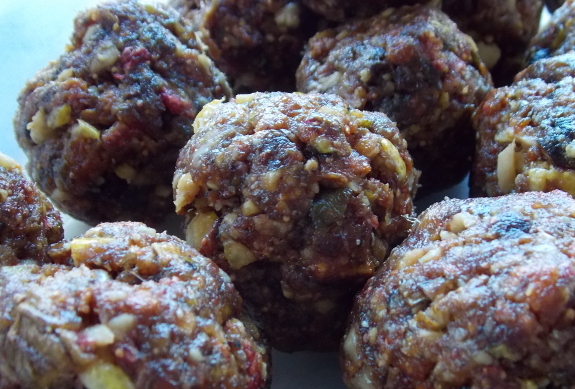 The fruit-and-nut balls make me think of a vegetarian pemmican and are pretty healthy for something that tastes like a dessert (145 calories per ball, 9% protein, with 15% of your daily allowance of fiber). Of course, Mark still thinks this is one of my crazy family dishes, best avoided. Maybe if I came up with a better name than "golf balls," he'd give it another try. Want to help redub the dessert? Our chicken waterer keeps coops dry and your flocks' drinking water clean. Homemade Larabars. Commercially made Larabars are about a buck each! They're a perfect snack for primal eaters, but kind of expensive for a snack. I love your idea of adding a lemon. I usually just use a mixture of dried fruit with whatever nuts I have on hand. Might Mark (and me) enjoy them a bit if you added some dark chocolate to the mixture? If you are making them for Mark to eat, you could call them Mark's Balls... It might make for interesting conversations as well. "Would you like to taste...."
Funny, i was just considering making what we call " energy bites" for our long training runs- they are quite similar to your childhood recipe- coconut ( i have unsweetened flakes usualky,mbut can use fresh coconut too), dates, nuts of any kind, usually chia seeds or ground flax seeds, and, instead of a lemon, the grated peel of an orange. I make them into balls smaller than golf balls- more like the size of an avocado pit. They are great energy for the trail... So maybe yours could be " power bites" or "zesty lemon date nut dried peach balls". Ok, maybe not that last one. We still talk about Golf Balls, with increasing frequency lately. Mike loved them, but I'm with Mark. When you say "whole lemon" do you use the peel, too? Terry --- I sure do. In fact, the zest is what really, well, zests up the golf balls. If you don't like the slightly bitter taste of the white under the peel (which I do), you can cut off the zest (yellow part) and add it, then squeeze in the juice, discarding the potentially bitter part. BTW, I love that you've added lemon to this recipe -- some tartness is good balanced with such heavy sweetness. I like a bit of bitter, so I think I'll try that, too. Thanks again, love your site.